Stephen Curry of the Golden State Warriors celebrates holding his daughters Riley and Ryan after defeating the Cleveland Cavaliers 129-120 in Game 5 to win the 2017 NBA Finals on June 12, 2017 in Oakland, California. 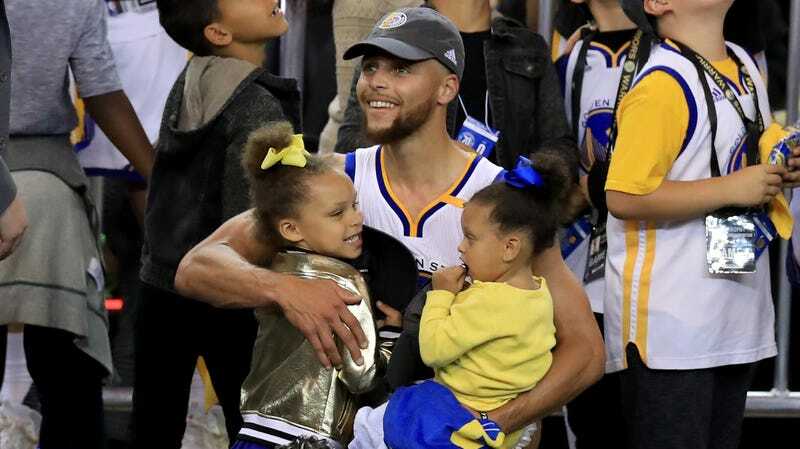 Well, Steph was presented with a new challenge this week, as a 9-year-old fan named Riley, coincidentally the same name as Curry’s eldest (and most famous) daughter, penned him a letter about his kid-sized Under Armour Curry 5 sneakers, which were previously only offered in boys’ sizes. Curry got the message and instantly sought to remedy the issue with Under Armour. Within days, the Curry 5s were also listed under the girls offerings. In addition, Steph sent Riley her own pair of Curry 5s and shortlisted her for the Curry 6 as well, to help her #RuintheGame. In our experience, this seemingly minor sizing gaffe has been a longstanding issue; so much so that we’d stopped even batting an eye at occasionally having to shop for our coveted kicks in the men’s section. But from the mouths of babes often comes teachable moments—especially from little basketball-loving girls named Riley.